The journey starts in Bariloche, a large tourist city in Patagonia, bordering Lake Nahuel Huapi. Along the route you cross Playa Bonita at km 8 and at km 10 is the foot of Campanario Hill, where there is a chairlift that takes the traveler to the summit 1,050 meters high. 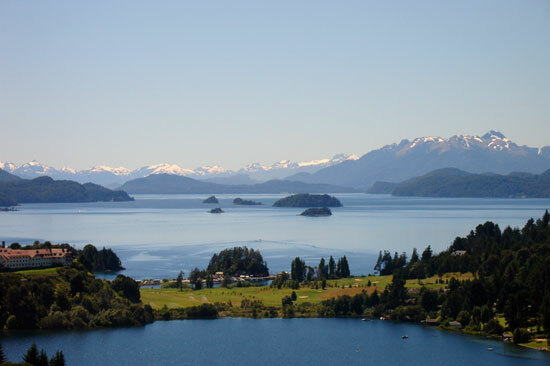 From there you can see one of the most beautiful and fascinating views of the region, looking at the Lakes Nahuel Huapi and Perito Moreno, Small Lake El Trebol, San Pedro and Llao Llao peninsulas and Victoria Island. In Llao Llao peninsula lies the San Eduardo Chapel, a regional architectural gem, and over Lake Nahuel Huapi is the important Port Pañuelo at km 25. Following the path you will cross Angostura Bridge over the river of the same name that joins Lake Moreno and the Llao Llao Peninsula. Then you cross the bridge over Lake Moreno in its narrowness and you begin to skirt the samll lake El Trebol, closing the Circuito Chico and returning to the city. In the spring you can go through the paved road encased in yellowing trees. Enjoying summer in Playa Bonita, Playa Serena, Villa Tacul, Angostura stream or Lake Moreno suntanning, fishing and practising water sports. In the fall looking at the mirror lakes the golden poplars and in the hills the red mantle of the lengas. And finally, in winter you can see the imposing frame of Millaqueo, Capilla, López, Tronador, Catedral, Ventana and Otto Hills, all snowed and in contrast with the blue sky. The Circuito Chico may be revisited regularly because it has multiple options: from hiking trails in the woods until chopped to ascend to the hills. From beaches and bonfires, to restaurants and teahouses. From lifts to great places for horseback riding. Typical postcard of Patagonia. In Bariloche Circuito Chico overlooking the lakes Nahuel Huapi at the bottom and Moreno at the front. Photo courtesy of Juan Pablo Borches. Fourtrax in Bariloche Rides a Fourtrax at cerro Catedral either in summer or winter. Cerro Catedral: the most important ski resort 19 km from the city of Bariloche is Cerro Catedral, a ski resort of international class. Catedral Alta Patagonia, cerro Catedral Catedral Alta Patagonia is the company responsible for Cerro Catedral. 40 lifts, snowboard park and chairlifts are some of the attractions. Catedral Winter Ski Season Cerro Catedral winter 2011 season rates for ski passes and lifts. Tours to Tronador Hill and Los Alerces Waterfalls This tour in Bariloche runs one of the most beautiful areas of Nahuel Huapi National Park in Patagonia, and the highest mountain in the area: El Tronador. El Bolsón from Bariloche From Bariloche you can visit numerous places, including El Bolsón, a beautiful mountain village located at the foot of the Piltriquitrón hill. Colonia Suiza in Bariloche 3The Colonia Suiza in Bariloche is ideal for touring in a day. Famous are its gastronomy and homemade sweets. Circuito Grande through the Seven Lakes Route Circuito Grande from Bariloche passes through Valle Encantado, with its curiously shaped rocks, the Confluencia, Villa Traful and Lake Correntoso, among other places. Myrtle Forest and Victoria Island 1A traditional catamaran trip in Bariloche is the visit to Myrtle Forest and Victoria Island. Blest Port and Lake Frías From Bariloche a tour to Los Cántaros Falls and Lake Frías.